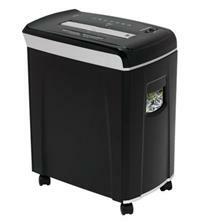 The Ativa AT-12X Cross-Cut Shredder is ideal for the home or small office. It will shred up to 12 sheets of 70gsm paper at a time into cross-cut particles measuring 4.8mm x 55mm. This gives it a P-3 security rating, suitable for shredding your confidential documents. The 17 litre bin is a pull-out style and is very easy to remove and empty - and as well as paper, this shredder will handle credit cards and CDs/DVDs too. There is also no need to spend time removing staples and paperclips as the AT-12X will shred through these, allowing you more time to get on with shredding rather than prepping your documents. Throat width is 220mm for A4 paper shredding and the shredder can be used for up to 5 minutes continuously before it requires a cool down period. Other features include: Auto stop on bin full and bin removal; auto stop on paper jam; overload protection; quiet operation at 68dBA; a viewing window so you can see when the bin is getting full; and castors so you can easily move the shredder around in the home or office. For your peace of mind, the Ativa AT-12X Cross-Cut Shredder comes with a 2 year warranty on the machine and 5 years on the cutting blades.